Fractures of the fifth metatarsal of the foot are surprisingly controversial among radiologists, particularly concerning proximal metatarsal fractures. Some term these fractures Jones fractures, others dancers fractures, while others simply term them proximal metatarsal fractures. According to Orthopedic Radiology (Adam Greenspan, 3rd edition), a "true Jones" fracture occurs one inch distal to the base of the fifth metatarsal. It is not due to peroneus brevis tendon avulsion but rather a twisting inversion injury to the foot. Greenspan states that more proximal injuries are frequently misinterpreted as Jones fractures but really are avulsion fractures by the peroneus brevis tendon. These latter fractures heal quickly, while more distal fractures may undergo fibrous union only. 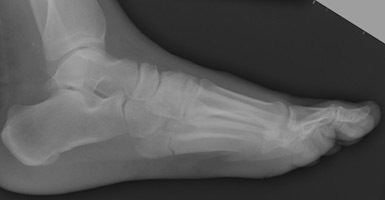 A Lateral radiograph of the foot. A patient stepped off a curb and sustained a fracture of the proximal aspect of the fifth metatarsal. According to Greenspan, this would be termed a "true Jones fracture." B Oblique radiograph of the foot. Two years later the patient returns for continued pain. 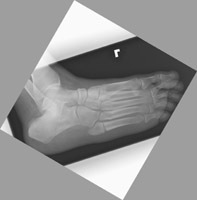 A radiograph reveals nonunion of the fracture, a frequent complication of the Jones fracture. C AP and oblique radiographs of the foot. 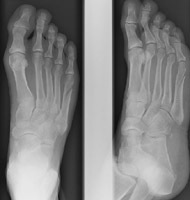 In contradistinction, this patient sustained a fracture of the proximal aspect of the fifth metatarsal. Greenspan terms this an avulsion injury. D AP and oblique radiographs of the foot. 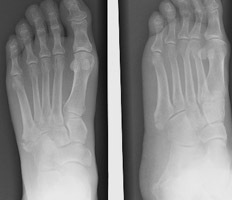 This patient demonstrates a fracture of the distal aspect of the fifth metatarsal.